The market for M2M solutions is constantly evolving, with many factors making significant impact on enterprises that are considering the development and implementation of a new M2M solution. Market demand for M2M is moving from a purely high-end product focus, such as cars, excavators and smart meters, to virtually any type of product, such as food containers, personal navigation devices (PNDs), pets and even Barbie dolls. In addition to this broadening scope, there is an increased demand for solutions that are truly universal and adhere to the numerous global standards that are currently in place and evolving. Many companies have experience with their own markets and national mobile network operators, however when they take the application to a new market, problems arise. Finally, contrary to historical usage, it has become obvious that a combination of low volume and high volume applications can be needed to serve just one vertical, such as the case with the automobile industry. The impact on enterprises developing and implementing M2M solutions are apparent, but problems arise when key areas for developers within the enterprise are overlooked. The three primary topics to consider when implementing M2M solutions are the openness and control of the solution, the burden of trying to implement an M2M service in-house, and the ability to scale globally. First, it is important to ensure that open (platforms that embrace industry standards for delivering services) and controlled environments are created. This is necessary to guarantee that enterprises are in control and have a future-proof platform. A solution to this problem is to make sure that the data management platform (sometimes referred to as an application enabling platform) is an open and future-proof architecture, which allows customers to freely choose the most suitable combination of devices and applications to fit their needs. To break it down, the data management platform is a managed application enabling platform allowing for quick and easy deployment and operation of new M2M solutions based on a device library and generic service enablers that should be designed to telecom principles of scalability, reliability and security. Basically, it enables any device to communicate with any application. When the architecture design philosophy is open, it becomes a horizontal service architecture, shielding the complexities of the devices from the applications, and vice-versa. By ensuring that the architecture is open (not silod) and future-proof, enterprises can be sure that they have full control of the user experience. Second, it is widely thought that its a wise investment to launch an in-house new M2M service. Does the wheel need to be re-invented when designing a solution, or is there an existing platform that serves the connectivity needs? Enterprises must consider the investment needed in-house to launch a new M2M service. There are plenty of examples of companies that built an M2M service (the fleet management industry is a good example) on in-house protocols, and design, and later found out they could not sell their offering to any other truck manufacturers. Now most OEMs are using standards-based platforms with open APIs to ensure they are future-proof and compatible. Weve seen the consumer market expanding and demand exploding for embedded connectivity and new devices, such as connected PNDs, tablets, and connected picture frames. These emerging markets need to be targeted in order to capture high SIM volumes. 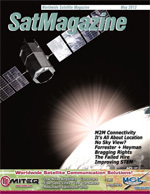 M2M connectivity providers have spent years perfecting connectivity solutions and adjusting to the market to fit its needs. Does an enterprise have all of the problem solving tools in-house to develop an efficient M2M service? How do they know the approach that they are taking is correct? For example, what if it is more cost effective for an enterprise to take a layered approach to implementing a business and life critical M2M solution that includes connectivity, and horizontal data/application management. By working with a global M2M connectivity provider, the enterprise can then develop their own application and vertical development at the highest layer, reducing time to market, guaranteeing quality of connectivity and having will have the ability to support multiple vertical applications. Lastly, being geographically limited when choosing an M2M provider inhibits the increasing demand for solutions that work globally and have the ability to adhere to global standards. Today, technology that is implemented in one part of the world could have a great impact on another. Each part of the world has different connectivity requirements and needs. The connectivity offering should support a variety of bearer services with an emphasis on GSM-based technologies due to the proliferation of the technology on a global basis. Most devices do not switch freely between technologies, cellular (GSMA or CDMA), satellite, and NFL (Zigbee, WiFi). Most European M2M service providers only build in GSMA standards into their application, and then must redo some testing, integration, development, etc. to enter the U.S. market if they want to do it with CDMA. Today, its very rare to see WiFi integrated into an M2M device. Using a dedicated platform for M2M, customers are ensured of the highest level of reliability and flexibility for M2M offerings. Industry leading tools for connectivity monitoring through a service portal or API, gives customers full control over multiple applications from one source. Adherence to GSMA embedded standards for M2M connectivity is also important. This ensures that the M2M solutions introduced by the enterprise are reliable, compliant to standards and future proof. Additionally, its important that the enterprise understands the need for high or low volume data, and how to reduce costs associated with data transfer. Offerings to enterprises are generally based on the value of the connectivity service delivered rather than a price per megabyte. By choosing a connectivity provider that is an expert in the global market, the customer will continue to maintain full control of status, location and performance of connected devices regardless of a vertical market, while enjoying the highest level of customer service awareness and responses. In summary, a packaged solution with horizontal data and application management and a premium global connectivity is both a cost-effective, and time-saving offering for enterprises. Before consideration of development or reinvention of existing technology, its worth a closer look.